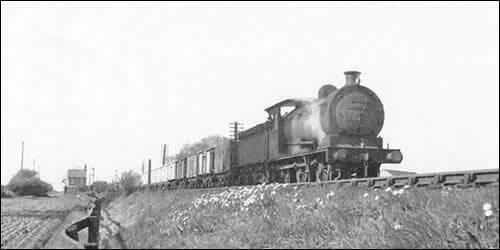 A photograph of a goods steam train at Blue House, East Boldon. Engine No. 65886, taken on the 27th April 1957. It reminds me of Thomas The Tank Engine. Sent in by © Allan Edwards. 0-6-0 J27 on freight c1957. Sir Vincent Raven took the design of J24-J25-J26 over and built 105 J27 between 1906 and 1923. These were superheated and had piston valves. In 1959 scrapping began but some made it to 1967. Number 65894 has become NER 2392 in preservation. I used to visit this location as a train spotter in the 1950's. The view is facing up the line towards East Boldon station. The house in the distance was "Blue House" where there was a level crossing operated by a man who worked from a small shed nearby (during the day). It was very rare to see a vehicle actually use the crossing so he wasn't very busy. He was a friendly chap and on arriving for his day's "work", his first task was to get the stove going. He would walk up the line towards Boldon with his coal bucket and be back in about 15 minutes with a full bucket. Coal that had fallen off tenders. I remember there was a farm nearby as well. Some really fast 12 coach express trains would rattle through here from Newcastle to the south, sometimes with brown and cream Pullman coaches which had 6 wheel bogies, to give a smoother journey. I saw many V2's and A3's whilst there. An A3 No. 60184 Trigo was a regular.